More than 30 years ago, the seemingly race-neutral world of ecological activism was redefined by a new category of oppression: environmental racism. The fact that hazardous refineries, incinerators, landfills, and toxic factories tended to be located not only in poor neighborhoods, but in poor minority neighborhoods was surprising to exactly no one. But simply naming the phenomenon had a clarifying effect. It captured the unprecedented alliances between civil rights, religious, and environmental groups that were springing up in places like majority African-American Warren County, North Carolina, where residents protested a toxic landfill in 1982. A wide-ranging study by the U.S. General Accounting Office further exposed the racism that informed the siting of such toxic areas throughout the United States. And in 1990, sociologist Robert Bullard's Dumping in Dixie further clarified the argument: Environmental racism was real. Three decades on, how has our understanding of the phenomenon evolved here in Memphis, where poverty and racial discrimination have always gone hand in hand? 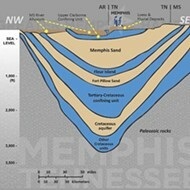 Locating toxic dumps in the South was always a case of environmental racism writ large, and Memphis has borne its share of it. In fact, in terms of resistance and civil rights, the sanitation workers' strike of 1968, with the many environmental and health concerns it raised, is seen by many as the founding battle against environmental racism. By the 1990s, redubbed as the Environmental Justice (EJ) movement, activism around the topic gained steam. The Environmental Protection Agency (EPA) formed an Office of Environmental Justice (OEJ). 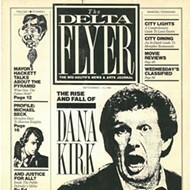 President Clinton signed Executive Order 12898 in 1994, which explicitly tied the work of the EPA to civil rights law. Today, despite the Trump administration's attempts to hobble the EPA and the OEJ, that executive order still stands, and the work of many dedicated career EPA professionals goes on. At least, for now. Doris Bradshaw and Frank Johnson at a playground adjacent to a drainage ditch from the old Defense Depot. Despite official reassurances, they still feel sure the area's unsafe. In Memphis, as it happened, the new environmental justice struggle was taken up almost immediately. It was fueled in 1992 by the EPA's designation of the Department of Defense Depot on Airways Boulevard as a Superfund site — a tag reserved for the most heavily polluted locations in the country. The 632-acre area had been the military's go-to dumping ground for all manner of chemical weapons and other toxic materials since the 1940s. But the EPA's targeting of the depot as a priority for remediation and cleanup was the beginning, not the end, of community activism there. And it's indicative of how the environmental justice movement as a whole has progressed in the Bluff City. Doris Bradshaw has spent nearly all her life near the Defense Depot, and she still lives on Mallory Avenue, nearby, where her grandmother lived for decades before her. "In 1994, there was a letter that came to everybody in this area," she recalls. "My grandmother, she practically had a farm here. She was eating off her land in the back. We don't do that anymore." The letter, and official recognition of the dangers posed by the depot, was unexpectedly relevant to her grandmother when, only a few months later, Bradshaw says, "We found out she had cancer." Doris Bradshaw in her home near the Memphis Depot. Her grandmother's subsequent death spurred her into a pursuit of activism that has continued to this day, much of it fueled by her personal experiences with family and neighbors battling cancer and other ailments. Despite the federal actions to mitigate the depot's contamination, locals' interactions with the EPA and other agencies have been marked by a disconnect between official reassurances on one hand and the deaths of loved ones all around them on the other. The measured tones of agency reports bear little relation to the life and death experiences of community members in the depot's backyard. "I got this book from the Agency for Toxic Substances and Disease Registry (ATSDR), who had done an assessment of our community," Bradshaw says. "It said, 'these drainage ditches may be contaminated.' Everything was 'may be,' 'could be.' I asked them, when they were digging the bombs up, how it would affect our community. 'Oh, y'all will be okay,' they said. 'If something happens, put wet towels around your door, and cut off your air conditioning.'" Bradshaw and Frank Johnson, another native of the neighborhood, aren't buying those reassurances. They rattle off the many ways their friends and family have died. Johnson says, "My mother developed an agressive brain cancer in 1998. My oldest sister is recovering from the same brain cancer now. And as soon as my middle sister moved back here a couple years ago, her doctor told her, 'You've got some aggressive tumors in your uterus.' They had to take everything out. This was last year. My neighbor, Jasmine, same age as me, they took the same tumors out of her four years ago. My neighbors, the Taylors, twin daughters, one of the twins developed this rare bone cancer. Next house, the Smiths: four different types of cancer. And this is just on my street." The Department of Defense followed through on the cleanup mandated in the 1990s. Heated rods were buried in the ground to encourage chemicals to off-gas; caches of mustard gas bombs were dug up and hauled away; buildings were demolished. 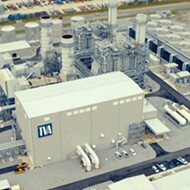 Now it is the Memphis Depot Industrial Park, and it hosts a large Barnhart facility. Earlier this year, a real estate partnership bought the land for $50 million. On the surface, all is well, it would seem. The residents' experiences are merely anecdotal — difficult for any governmental agency to address, except with more studies. As Bradshaw describes it: "They say, 'well, have you done a study?' No! The study is already done! Look at all the people that are dead! Our life is the study." And so Bradshaw, now 63, soldiers on, an activist with a cause that gets harder to define. The depot site was closed in 1997 and declared "Ready for Anticipated Use" in 2010. But with decades worth of toxins lodged in nearby residents' bodies, deaths and infirmities may go on. 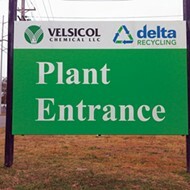 The former site of the Velsicol plant, closed in 2012 and still undergoing cleanup. Even so, Bradshaw feels she has accomplished much. "I feel good about the education of people. I don't have to go tell people, 'Now, don't put no garden out there.' I don't have to tell them, 'Don't let your children go play in the ditches.' They finally got it. Some of them had to wait until something happened to them before they believed it, but they did get it. We're getting there, but we're still not where we're supposed to be." Had Your Fill of Landfills? In one sense, Bradshaw's activism created a living legacy: her daughter Marquita, who grew up in the depot's shadow. As she began her college years in the early 2000s, Marquita founded the group Youth Terminating Pollution, cutting her teeth on campaigns to raise awareness about the depot's legacy. "The pollutants were impacting the reproductive systems of teenagers. You had 13-year-olds with ovarian cancer and 17-year-olds with prostate cancer," she says. "The rate of reproductive cancers around the depot area was outpacing the national average. And that's when I really got involved." Whitney Achievement Elementary School in Frayser, and the adjacent land that was slated to become an 80 foot landfill for Memphis Wrecking Company. That experience left her well-versed in the scientific and legal jargon one needs to mount a successful resistance to environmental threats. And lately, that's come in handy with an issue that's old hat to environmental justice warriors: landfills. As Marquita Bradshaw explains, "The depot was a landfill. It was a chemical and biological warfare landfill. We're still educating people about the dangers of that, but also how unsustainable all landfills are, period." Landfills brought environmental racism to the national news this spring, when the EPA rejected claims by residents of Uniontown, Alabama (90 percent African-American) that the siting of a landfill near their town was a violation of the Civil Rights Act. Scott Banbury, who works with the Tennessee chapter of the Sierra Club, points out that "Uniontown is where they sent all of the coal ash that had to be removed from the Clinch River after the Kingston Coal Ash Disaster. That's going to be a huge issue here in Memphis, because the Tennessee Valley Authority wants to dig up their coal ash ponds here and haul them to a landfill somewhere — either the South Shelby Landfill or the North Shelby Landfill." Look for disputes over that in the future. But while the toxicity of coal ash dust from such sites is undisputed, landfills of a different provenance have already figured heavily in local news this year. In January, environmental justice activists from Frayser brought the proposed expansion of a construction and demolition landfill to a grinding halt. As community organizer and Girls, Inc. CEO Lisa Moore describes it: "The Memphis Wrecking Company (MWC) had purchased over 30 acres, but in order to do what they wanted — the landfill — it had to be rezoned. We fought the rezoning, so they could not expand their landfill operations on a property adjacent to an elementary school and across the street from the Girls, Inc. Youth Farm." Unlike MWC's previous landfill, the new one would have been 80 feet in elevation. Despite claims that construction and demolition waste was not toxic, citizens were resolute in their resistance to having the landfill built near a school. Activists note that Cane Creek is fed by 21 separate streams from the Memphis Depot area. In some areas, they've succeeded in having fences put up to keep children out. The struggle was years in the making. "It never really made it all the way through the Land Use Control Board for the first two and a half years," says Moore. "They'd get 100 percent pushback from the obligatory public meetings, from community members that would show up in force, and they'd pull their application. Then they'd try to 'incentivize' us to come on their side. Girls, Inc. was sent a donation, so I sent it back. Whitfield Elementary School was promised field trips for everyone. They declined that. Others received little 'Gee, we can help you with this' types of incentives. And everyone declined." Though MWC contributes heavily to the election funds of seven city council members, councilman Martavius Jones, though not from Frayser, took up the citizens' cause. Lacking approval by the Land Use Control Board, the city council voted unanimously against it as well. Moves by MWC to put the landfill in Hickory Hill were immediately resisted by citizens there, who received support from the Frayser activists. In any case, it became a moot point when the city council declared a six-month moratorium on all landfill proposals. With that moratorium now passed, landfill fights are heating up once again. Last Tuesday, the city council agenda included consideration of a proposal by Blaylock & Brown Construction of Collierville to establish two of its own construction and demolition landfills, one near the Wolf River on Shelby Oaks, and one on Holmes Road, near Longstreet United Methodist Church. The latter, however, was near the residence of one Marquita Bradshaw. The Cane Creek drainage ditch carries Depot runoff directly through the grounds of Hamilton High School. Longstreet Methodist's Pastor Tondala Hayward brought Bradshaw on board for the fight, and she brought her activist savvy to the table. "I was like, look, don't meet with these people alone," she says. "We should all go together as a community to see what they're talking about. And that way you maintain your credibility and you'll have witnesses. The church members were strongly against the landfill, because kids worship and play there. And it's also just a viable community. Why would you want a landfill in the middle of the city?" Local resistance was cinched when the church activists made a surprise visit to Blaylock & Brown's existing landfill in Collierville. "You could actually see what was considered non-destructible waste," recalls Bradshaw. "It was textiles, it was plastic, it was foam, it was different kinds of particle board, and pretty much anything that they couldn't sell off. There was a stream close by, and that's when a lot of lightbulbs went off and we went 'Hey, our site has wetlands, too.' This stuff, even with it being crushed up really, really tiny, is toxic. It's not good for the natural water filtration process, the way streams and wetlands all connect together and recharge the aquifers. It was just unacceptable." Seeing that opposition was imminent, last week, the city council postponed the question of approving Blaylock & Brown's application until August 28th. And, as she has been since her days living near the Defense Depot, Marquita Bradshaw is ready. Landfills and dumps can be the most obvious assaults on a community, as a stretch of open land becomes a veritable ground zero for pollutants. Industrial sites, like those left behind by local corporations such as Firestone or Velsicol, do the same with their legacy of brownfields. But lately, as the environmental justice movement evolves, it's taking on new, more subtle fronts, as well. Take the current work, just launching, to address the issue of substandard housing in Memphis. It's telling that the Healthy Homes Partnership originated with Le Bonheur Children's Hospital and a mutual concern for children's health. As grant development coordinator Cathy Marcinko recalls, "We had an asthma program, and right from the very start we knew that housing was a factor, so we wanted to work with the county and city healthy homes programs." As Banbury notes, "The biggest environmental justice issue now is substandard housing. Mold or old plumbing that is exposing [residents] to lead, or other things like termites or beetles chewing on wood and other precursors to asthma. 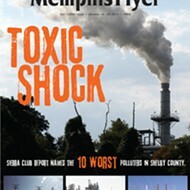 Memphis consistently is either number one or number two as an asthma capital in the country. And then homes that need weatherization lead to outrageous energy burdens in low-income communities." Marcinko adds: "The National Center for Healthy Housing ranks metro areas in terms of the health of their housing. And the Memphis metro area is dead last, out of 40 or 50 cities. That's the kernel of the environmental justice issue: People don't have a choice. They can't choose better housing to live in because there's not enough affordable quality housing, and yet what they're living in is making them sick, in many cases. Or poisoning their children in the most serious of cases. That's the tragedy of it." In response, Marcinko helped spearhead a new approach: "Le Bonheur secured the original funding, and then the city made a commitment of funding as well, a three-year commitment of funding from the Department of Housing & Community Development, under Paul Young," she says. "And then we also received assistance from United Way." And a nonprofit known as Green & Healthy Homes Initiative, with nationwide experience on the issue, offered services. One aspect of the program, still in its early stages, is to take a more holistic approach to subpar housing. Marcinko explains: "We're trying to get programs to work together on individual housing units, where the family or the occupants are eligible for multiple programs. For example, you may have a senior who has an older home, and there's a grandchild, living in the home who's been lead-poisoned. So the family might qualify for the lead-hazard prevention program for the child, but there also may need to be weatherization done in the home. And the senior may be eligible for weatherization assistance through MLGW or some other program. So there are ways you can blend that funding together. We're working on trying to find out how to do that. It's easier said than done." Many of the points of struggle for environmental justice are no-brainers, and that continues to serve in recruiting new activists. As Marquita Bradshaw says, "Why would you want a landfill in the middle of the city?" But why would you put a military waste depot in a residential area, for that matter? Why wouldn't you coordinate all the services available to make homes healthier in multiple ways? The answers seem obvious, but, as always, it's easier said than done. Marquita Bradshaw says the holistic approach is really at the heart of the movement today. "Environmental justice is what a person needs to interact with the physical environment, the political environment, the health-care environment, and the educational environment — to be an individual, so they can thrive. These things are intertwined. Because a whole person needs housing, a whole person needs access to food, environmental integrity, and health. It is a human-rights movement. Environmental justice is human rights."